I just watched the new DVD of BILLION DOLLAR BRAIN last weekend and was wondering why this score hasn't been "officially" issued on CD. I know the UA LP from 1967 contains most of the score but it would be nice for a CD re-issue with the few extra minutes added on. Here's to hoping someone finally does this score justice on CD. P.S. 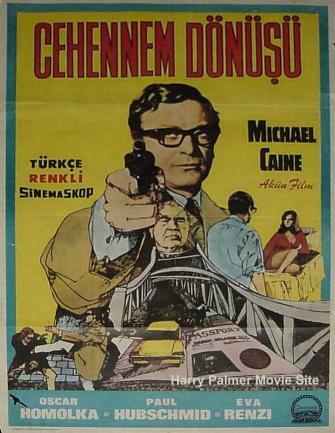 Interesting that after the success of THE IPCRESS FILE, John Barry never scored another Harry Palmer film. (Konrad Elfers scored the following film, FUNERAL IN BERLIN and Bennett finished the series with BILLION DOLLAR BRAIN. I'm not counting the 90s films done for cable and scored by Rick Wakeman.) I am guessing it was most likely to producer Harry Saltzman's distaste for Barry's work. I also saw past week the film and found the score very good. The opnening titles with tat theme are gorgeous. I know there some "rare" edition paired with Barry's IPCRESS. I fully agree with your take on BDB's main theme (maybe my enthusiasm is even bigger than yours ). Glad to have the score. Just a pity sound quality is poor. I should check the LP sound...but I guess the distortion stems from the LP. By the way, I know Elfer's FUNERAL IN BERLIN is usually looked at with a bit of disregard, but I for my part think it's a very pleasurable listen, too (more so since I watched the recently released DVD of the movie) and fits well into the trilogy. FUNERAL is also the best Palmer film by far. I got BILLION DOLLAR BRAIN on DVD for free (otherwise I might have just rented it). I've always wanted to see FUNERAL IN BERLIN and when I went to add it to my Netflix list I found they don't have it. Hard to believe, but the damn thing is already out of print! I'll have to scour the used stores for one now. I also have a high regard for Funeral in Berlin. Anyone know anything about Konrad Elfers? By the way, I bought the DVD last year for just 6 Euros (new, regular price back then)...I never regretted it, even though it includes virtually no extras. This movie has great 1960s flavour...Berlin...the yellow/brown/orange colours...Elfers jazzy score...tasty. Besides, I was quite impressed how well its sound and picture quality stand the test of time...even almost 40 years after (ok, it has been cleaned up a bit...as a comparison of the original and the German sound reveals). Here are some quotes by Sir Richard Rodney Bennett on BILLION DOLLAR BRAIN during an interview at his Manhattan residence on December 17, 2001. The complete profile and interview will appear in FILM SCOREMONTHLY. "The main titles of BILLION DOLLAR BRAIN are of computer printouts about Harry Palmer. So you saw all these machine like happenings. I had recently seen Labaie des anges (BAY OF ANGELS) scored by Michel Legrand which is about gambling.He used a lot of piano keyboarding sounds, and so I did steal that idea, so the title music is three grand pianos playing in front of an orchestra. I did not use any instruments that sounded sympathetic like strings or flutes. I used alot of percussion, brass, and pianos, and this extraordinary French electronic instrument called a ondes martenot. It was a coloristic decision. I did not know John Barry's score, and BILLION DOLLAR BRAIN was kind of fun in that kind ofway. You often get a cue for a film from a)something from in the film itself,and b)from somebody else's score." Sir Richard Rodney Bennett, interviewed by James Phillips, New York City, December 17, 2001. Thanks for the info, Urs. An unsung hero, in my book. In the UK, by the way, it's Pippi Longstocking! ""It's one of Bennett's better scores and I believe the first use of the Ondes Martinot by him. The Maurice Binder main title with Bennett's cascading piano melody is brilliant. (I believe he said in a recent interview he was inspired by Michel Legrand's score to BAY OF ANGLES when writing that piece.)"" It never occurred to me Bennett was influenced by Legrand's Bay Of Angels when composing his main title - but now I can see the similarity - especially as Bay Of Angels was a prized EP of mine back in the late Sixties. Of course Bennett's music is something else again - and I think he utilises more than one piano - as did Dave Grusin on The Firm. Thanks a million for mentioning the interview which appeared in FILM SCORE MONTHLY, Vol. 7, Number 2, February 2002. Sir Richard is a true music scholar and gentleman who loves American Jazz and the Great American songwriters (Berlin, Arlen, etc.) and has many stories under his belt about the film music industry in Europe and the USA. One very influential and helpful person to Bennett in the early days was conductor and music director Muir Mathierson. You should also check out his early Hammer horror scores THE DEVIL'S OWN (1966), SATAN NEVER SLEEPS (1962), and THE DEVIL'S DISCIPLE (1959) especially after listening to THE MINES OF SULPHUR, an opera he composed when he was twentyeight. Dedicated to Benjamin Britten, THE MINES OF SULPHUR is a very unusual scored Gothic work, almost the antithesis of the lush Romanticism Bernard Herrmann used in his WUTHERING HEIGHTS opera. And don't forget his score to the Bette Davis movie THE NANNY! With the release of Frank DeVol's HUSH...HUSH, SWEET CHARLOTTE score, and hopefully Andre Previn's DEAD RINGERS, maybe we can add Bennett's THE NANNY to round off a Bette Davis cinematic triptych. Richard Rodney Bennett also told me that Michel LeGrand had an enormous influence on his piano style and that was why he used the pianos and ondes montinet in that stylistic way.